Chamonix is world renown for its fabulous off-piste skiing. From the classic to the lesser known descents, the Mont Blanc massif offers some of the longest vertical drops imaginable, often departing directly from the cable cars stations. The guide of Chamonixskiguide, well specialized in his valley and in all types of skiing, will offer you his secret "powder spots" and can introduce you to the off-piste techniques. Season : from december to may, depending on snowfalls. Off Piste in Italy: Courmayeur, la Thuile, Gressonney, Alagna, Cervinia-Zermatt. 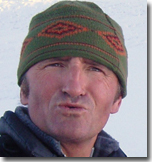 *Private guide : 400 € / day - 1 to 4 person I provide to you harness and avalanche beeper. Le Tour is the top hamlet of the Chamonix Valley. This village is famous for the record of annual snowfall in the Alps.. There are opportunities to practice steep couloirs, wide fiedls of snow, forest skiing. Today is the first day to recover your legs , check your kit, practice technique, gain confidence and new techniques from your guide . Usually we finish the day by a long off piste run to Trient a village in Switzerland. We go back to Chamonix by bus. This is one of the longest (23km) and most famous off piste ski runs in the world. The Aiguille du Midi cable car takes you to 3842m. We descend the short narrow snow ridge, which is fixed with rope handrails. 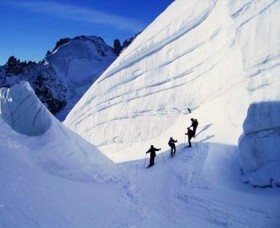 There are many options for the Vallee Blanche and all the routes are spectacular. They all converge at the Requin hut, where there is a restaurant , before skiing through the impressive Requin icefall. Your Guide will show you safely the best passages through the seracs for avoiding crevasses on snow bridges. Once you reach the flatter Mer de Glace glacier there is a straight run to the Montenvers railway. If there is snow at the bottom of the valley, we descent to Chamonix on a slope through the forest. If you have made quick time there is the opportunity for a second descent of the Vallee Blanche by an other route. Grand Montets cable car, which ascends to 3300m. From the top cable car there are two main route variations: left onto the Argentiere Glacier or right onto the Mer de Glace glacier (Pas de Chevre). From the top cable car you can ski from 3300m down to the valley, over the Argentiere glacier, off the end of the glacier snout, past the Cremerie ice falls, and through the trees. The Pas de Chevre is a great run to the Mer de Glace glacier to Montenvers. Usually there are multiple descents over the day. Drive through the Mont Blanc road tunnel to the Italian town of Courmayeur. Here you have the Italian face of Mont Blanc towering above you. You ascend the lift system to the top, Helbronner, where there are fantastic views of the famous summits of Dent du Geant and Tour Ronde. The descent is either by the steep couloirs to Courmayeur, or traverse on to the Vallee Blanche to find fgood snow on this side of the massif. Starting early from Chamonix, we drive to Cervinia in Italy. From here you ski into Italy or towards Zermatt in Switzerland. The numerous lifts enable you to find good snow with all the possibilities of orientations and steepness of slopes. A bit far from Chamonix, but Zermatt is one of the best place for ski mountaineering in Europe.